shows that the organisation is committed to supporting good health. Having a healthy catering policy will help make sure that providing healthy foods and drinks is part of your organisation’s regular procedures and that it becomes part of your workplace culture. Starting from scratch gives you an excellent opportunity to offer healthy foods and drinks through catering. 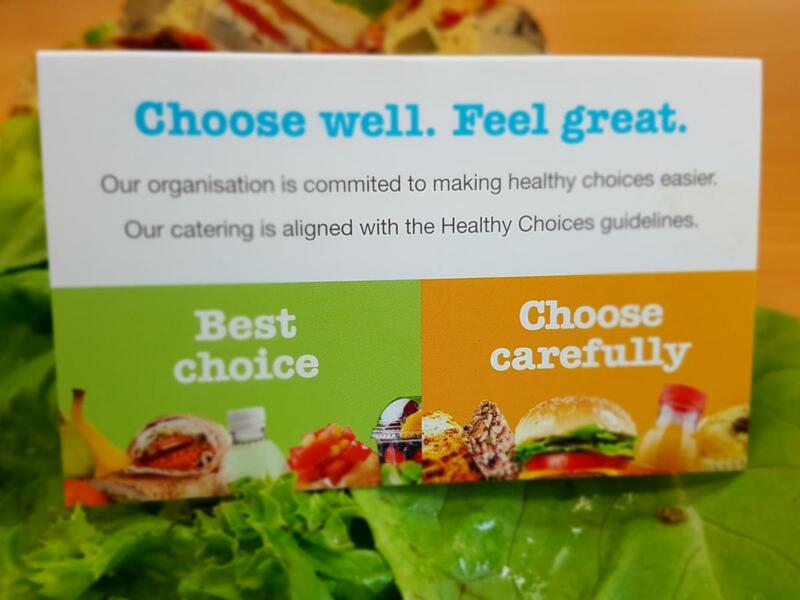 For ideas, refer to the Healthy Choices: healthy eating policy and catering guide for workplaces, Simple changes for healthy catering, research ‘healthy workplace catering’ online or check with your local council to see if local healthy catering guides are available. It is a good idea to ask staff about the foods and drinks they prefer to make sure they are happy with what is provided. research ‘healthy catering companies’ on the internet. If your organisation is putting out a tender for a new caterer, make sure you include requirements for healthy foods and drinks in the tender specifications. Once you have found a caterer that provides healthy options, you can sign a contract which includes a catering service agreement (link), which specifies that healthy catering is required for your organisation. This will help ensure that healthy catering is sustained and embedded in organisational procedures.